When I saw Horizon had these on sale for $179.99 I HAD to get 1! Glad I did! Here's the maiden flight highlights. I loved (past tense) my Radian XL as well. Had many great flights until one day I decided to get a bit "aerobatic" with the plane. I attempted to dive bomb straight down with the intention of pulling up 100' feet or so above the ground (a maneuver I love doing with my sport gliders) . As the plane was descending the main wing and tail started to flex and vibrate violently leaving me with zero elevator control. I don't know if I overloaded the tail servos or really what happened, but it was impossible to pull up and the plane crashed nose first into a grove of trees. Just a word of caution, be careful at high speeds. Did the same thing with mine , wing snapped right off. This plane is not to be used to do any high speed moves with. This was after having it for two years , I guess I got to comfortable with it. Reinforced the wings about half a foot from the center of the wing out on each side with white duct tape. All the leading edge with clear packing tape, one right at the edge and another strip starting the curve of the top wing. Placed another strip at the top center of the wing side to side. Yes, it may have added some weight, but can do hammerheads, loops, rolls, Immelman, Cuban 8s, etc. At the beginning they were sloppy and out of sync do to the large wingspan, but after a few batteries, they really looked smooth and graceful. The wings do flex, but so far after one year of heavy flying, the wings in one piece. The one thing maneuver it does not like is a very aggressive dive perpendicular to the ground, if it catches too much speed the weak servos and small controls is not enough. When doing them, enough altitude, rudder and flaps ready. There have been numerous reports of wing failures with the RXL, even the ones with the green dot on the box which were supposed to be updated at the factory. Has anyone ever used line struts ( upper and lower) for main wings? Supposing fishing line would work. Too keep the main wings from stressing out. Some type of screw in eyelets (for fastening the fishing line to fuselage) Or would they be ripped out of the foam? In the small group of guys at our old field, we've probably gone through 7 XLs and we have not seen any problems with wing strength, only in the weak tail section. My left wing snapped off coming out of a big loop, plane destroyed. 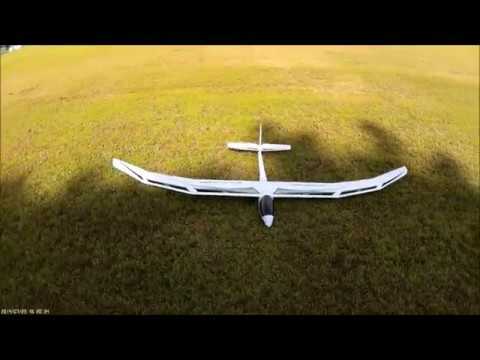 Now I own a FMS FOX 3000m glider, with stronger wings. I've had no problem with the wings or tail. Done loops, but I've done them at reasonable speeds. Coming out of a thermal, instead of diving I do a spin with the spoilers out (so it doesn't build up too much speed). Knock on wood I guess!! I am not going to try a terminal velocity dive after reading post #2! I use a 4-cell 1500 pack, I get much better climb performance. However, it does put a lot more stress on the plane and I have to be careful not to use full power. 2 years ago I was climbing out too aggressively, and the entire motor/prop broke out and flew right out of the nose! I was able to land the plane successfully but didn't find the motor & prop until a year later! (That model became spare parts for my second RXL, which I have been enjoying a lot. I'm not an easy flier like you I fly them hard. This plane had a known defect that they did a POOR job telling the owners to watch out for. They hid it on their web site. But I have a better plane now in the FMS FOX 3000MM GLIDER. The new Fox Glider, is marketed as a aerobatic glider. I've never considered the XL as such and I've always avoided heavy aerobatics with it. Just inspecting the wing sections, you can see there is minimal structural reinforcements in it and I've always feared that it wouldn't take much g's. You are correct, they are two different kind of planes, but the XL was my first glider which was cool while it lasted, and I loved it. No issues with mine so far! Thank The Lord. Go to Horizon hobby site under Radian XL and that is where the update bulletin about the glue joints on the left-wing slide joints have to be corrected or your wing will snap off in flight. Who knew to go there to look for this bulletin after you purchase the plane. That's what upset at me so much why I bought a different plane. Yeah I spotted the bulletin when I saw them on sael for $179! Ordered it & received it with 2 inspection stickers on the plane & 1 on the box. Flawless so far. I've done full throttle loops & anything else too. If she was gonna fail, she would've by now. Probably 30 or so flights so far. Actually more cycles on the airframe will make it more prone to failure. Hope that doesn't happen though! I'll lose it or crash it long before that happens. My Mystique RES was my first big sailplane. The early ones had a weakness in the wing root where the CF rod goes in and people were ripping wings off from the beginning when they were flying them a bit more aggressively than they ought to have been. I'm on my second one now. Each one has lasted several years. Crashed my first one into a tree in very high winds - gonzo. This second one has been flying for a while now and I don't foresee it failing due to fatigue for years. It'll likely die by my own hand from doing something I know I shouldn't be doing. This Fox, I'll likely fly the bag off it and do crazy stuff with it so it'll be interesting to see how long it'll last.